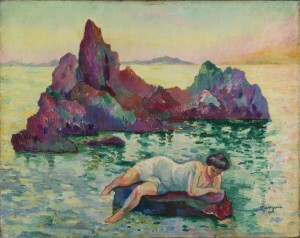 Henri Manguin painted Le Rocher, now titled La Naïade, Cavalière, in 1906 in Cavalière-sur-Mer, a small coastal town between Toulon and Saint Tropez in the south of France. He had become familiar with the area through the painter Paul Signac, whom he met in 1905. Manguin made regular visits to Saint Tropez, painting the town and the surrounding area, as well as a series of nudes for which his wife Jeanne often posed. La Naïade, Cavalière is typical of his Fauvist works—charming and intimate compositions that emphasized joyful effects of color. The French dealer Émile Druet lent three works by Manguin to the Armory Show’s New York venue: Le Rocher, Baigneuse (location unknown), and La Toilette (1907, location unknown). The Fauvist paintings that were exhibited there shocked and challenged the public and the critics. Though Manguin’s work was not singled out for specific discussion in the press, it helped to demonstrate the complete range of avant-garde painting that was being produced in Europe at the time. Manguin’s Fauvist canvases feature the vivid colors (often applied unmixed from commercially produced tubes of paint in broad flat areas), conspicuously broken brushwork, spontaneous execution, and bold sense of surface design that characterize the style. But his work was considerably less revolutionary than that of Matisse or Maurice de Vlaminck, and he did not achieve the level of critical success of many of his other colleagues. Rather than painting aggressive or daring subjects, he mainly created charming and intimate compositions that emphasized joyful effects of color. For a biography of the artist, see Henri Manguin, exh. cat. (Saint Tropez: L’Annonciade, Musée de Saint-Tropez, 2011).